At some point in the last few years I volunteered to write one of the In Your Element essays that appear on the last page of each issue of Nature Chemistry. Anne, the editor who looks after the series, has been periodically (pun intended) reminding me of this fact and pointing out that I was running out of time (and elements) – the March 2019 issue will feature the last of the In Your Element pieces. A while ago now I looked at the elements yet to be written about and just picked one — I decided to choose one that I knew essentially nothing about: promethium. If you want a potted history of promethium in roughly 700 words, then you can find my article here. The essays must fit on one page; this means that authors can’t just waffle on and so have to get to the point, but it also means that there isn’t a great deal of room for references. The sources that are directly relevant to specific points made in the article are cited, but there was plenty of background material that I could not cite – as such, I want to acknowledge those pieces here. First up is A Tale of Seven Elements by Eric Scerri. This book covers seven elements — protactinium, hafnium, rhenium, technetium, francium, astatine and promethium — that were discovered in the first half of the 20th century. Chapter 9 focuses on promethium and provided a useful overview at the outset of my research for the essay. The next source is an article in The Hexagon which is the (quarterly) magazine from Alpha Chi Sigma, the professional chemistry fraternity. The article ‘The Rare Earths – The Last Member‘ by James and Virginia Marshall is part of a series on ‘Rediscovery of the Elements’ and you should be able to find a pdf version of it here. There are some great historical pictures accompanying this detailed and informative piece on the history of the discovery (and naming) of promethium. Another helpful article that delves into the early claims of discovery and the work conducted independently by Charles James at the University of New Hampshire and B. Smith Hopkins at the University of Illinois can be found in the 2006 Bulletin of the History of Chemistry article by Clarence Murphy (there’s a pdf here). It includes the story of how Hopkins published his claim for the discovery of element 61 first (in two papers in JACS) and that James was a referee for them. James published his own work shortly thereafter in PNAS. There’s also a brief 2009 article in the Journal of Chemical Education by Lee Marek that covers the early naming controversy of whether the element should be called illinium or florentium. As I mention in my essay, this debate also played out in the pages of Nature. It all begins on June 5, 1926 when Hopkins and co-workers published The Element of Atomic Number 61; Illinium (on a side note, there’s no way you’d ever see a semicolon in a title in Nature these days…). Just over a month later on July 17, Nature published a letter from Bohuslav Brauner — not taking issue with the name, but with the fact that Hopkins had implied Henry Moseley had been the first to predict the existence of element 61. Brauner pointed to his 1902 paper predicting elements 43, 61, 72, 75, 85, 87 and 89. We believe, then, that the priority in the discovery of element No. 61 belongs instead to those who first had sure data as to its existence. Noyes then suggests that because Rolla deposited the results in a sealed envelope rather than actually publishing them, this demonstrates they were not sure of their discovery at the time, unlike Hopkins and colleagues who, he says, were sure of their findings. That appears to be the last word on the illinium/florentium debate in the pages of Nature. 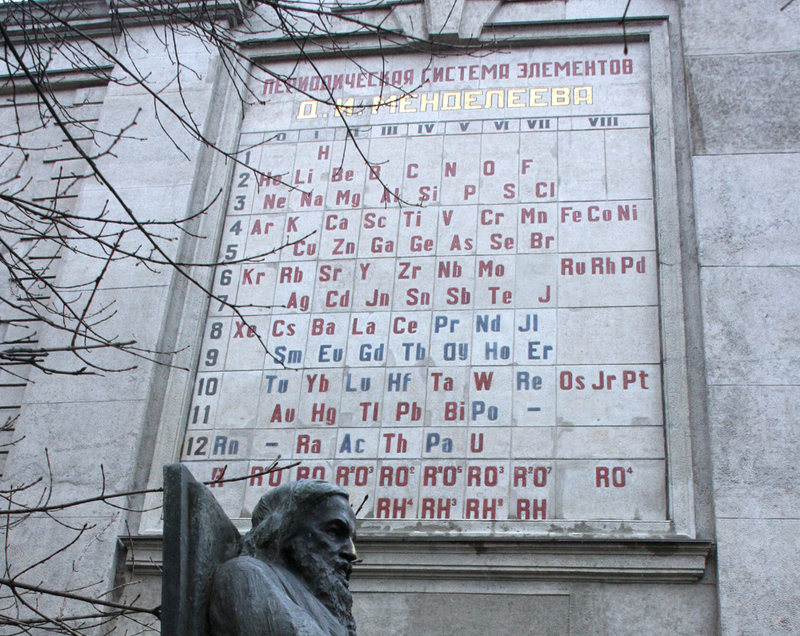 Of course, neither claim proved correct and so both names were ultimately consigned to history, but not before illinium found its way on to many periodic tables, including the fairly famous one below (what’s that thing to the right of neodymium…?). Artificial radioactivity has supplied chemistry with a powerful new instrument, and from the point of view of the discovery of new elements its most striking feature is that one is able now to create, by transmutation from other elements, the element one wants to study. He notes that the first successes for this approach came with Fermi’s discovery of transuranic elements, but it also provided the breakthrough in the search for the four elements lighter than uranium still missing from the periodic table** — element 43 had been made in the cyclotron at Berkeley. Without saying as much, the implication is clear; if element 43 could be made in the laboratory, could the other three be obtained in a similar fashion? …element 43, a lighter homologue of rhenium; element 61, a rare earth; element 87, a halogen and element 89, an alkali. This appears to be a mistake, either on his part or the journal’s, ’87’ should be ’85’ (astatine) and ’89’ should be ’87’ (francium). The discovery stories for each of these elements are fascinating and I recommend Scerri’s book that I mention earlier in this post as a good place to start. When it comes to francium, you should also check out this New York Times piece — My Great-Great-Aunt Discovered Francium. And It Killed Her. by Veronique Greenwood. We propose, therefore, the name ‘prometheum’ (symbol Pm) for element 61 after Prometheus, the Titan in Greek mythology, who stole fire from heaven for the use of mankind. This name not only symbolizes the dramatic way in which the element may be produced in quantity as a result of man’s harnessing of the energy of nuclear fission, but also warns man of the impending danger of punishment by the vulture of war. This is an excerpt taken from a C&EN article A Proposal of the Name Prometheum for Element 61 by Marinsky and Glendenin published just over a week after the meeting in Syracuse. The article notes that other claims were still ongoing (including one suggesting the name cyclonium) and there is even a footnote from the editor mentioning a request from B. Smith Hopkins (remember him?) to the board of directors of the ACS to appoint a committee to consider the various claims on element 61. Because element naming is an international matter it was decided to refer the matter to the National Research Council. Some may perhaps think the present proposal a little far-fetched, since there are more impressive effects of atomic energy known than the production of small quantities of a new rare earth, and classical students may take exception to the vultures — since Prometheus’ quarrel was with Zeus, the bird sent by his antagonist to torture him was, naturally, an eagle; but the etymology of this new name will soon be of as little importance as that of dozens of other element names which are much-less appropriate. Wow. Snark was alive and well in the pages of Nature in the middle of the last century. For those of you who, like me, might need to brush up on your Greek mythology, the Wikipedia page for Prometheus can lead you down many wonderful rabbit holes and consume many hours of your time. Go there if you dare. The ultra-short highly simplified version of his story is that he stole fire from the Gods and gave it to humanity; this angered Zeus and so he had Prometheus chained to a rock and sent an eagle to feed on his liver, which would grow back each evening so the eagle could come back the next day and feast all over again. This went on until Prometheus was freed by Hercules. There are also links to Pandora and her famous box/jar and it was reading this page that I discovered that the alternative title to Mary Shelley’s Frankenstein is The Modern Prometheus. Just think, maybe element 61 could have ended up being labelled frankensteinium! And Shelley’s husband, the poet Percy Bysshe Shelley, wrote Prometheus Unbound, a drama based on the torments of Prometheus. Anyway, I digress. The name for element 61 was confirmed at the 15th Conference of the International Union of Chemistry in Amsterdam in September 1949, apparently the same meeting at which the organisation changed their name back to the International Union of Pure and Applied Chemistry (IUPAC). However, the name agreed upon wasn’t the original ‘prometheum’ as suggested by Grace Mary Coryell, but ‘promethium’, with the ending changed from ‘eum’ to ‘ium’ to be consistent with the ending used for most other metallic elements (maybe that snarky writer in Nature did know best…). For some background on how element names end, see this Nature Chemistry essay from Shawn Burdette and Brett Thornton. Various other element names were confirmed (and spellings altered in some cases) at this meeting – see the C&EN article for more details. As I was researching just what on Earth promethium is used for, I kept coming across pictures of luminous paint (usually exactly the same picture). If you do an image search for promethium, you just see loads of pictures that look like this. We illustrate each In Your Element article with an image and I really wanted to avoid using a glowing green blob. Fortunately, there are a lot of awesome Prometheus statues — another internet rabbit-hole that it’s very easy to get sucked in to. Have a look at the essay to see exactly which one we went with; it’s one that can be found next to the Chernobyl Nuclear Power Plant (there are more details about the statue here). 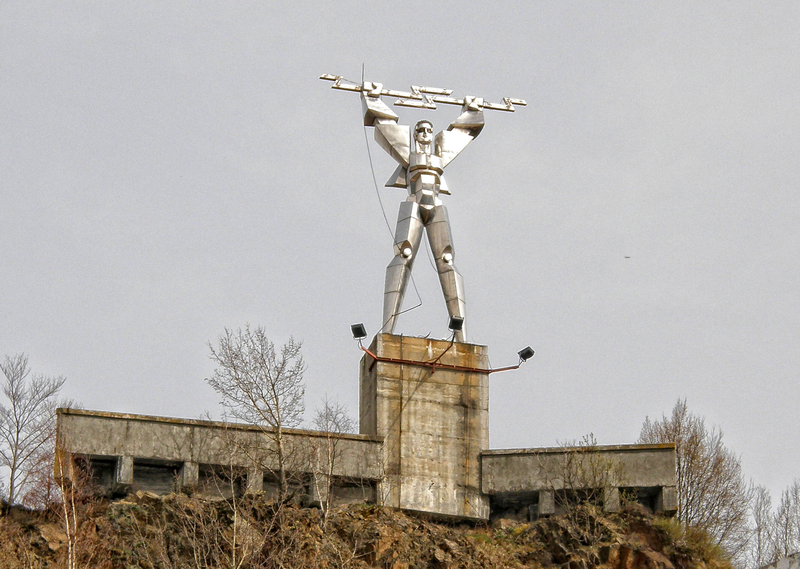 Here’s another of my favourites; this is a statue overlooking the Vidraru dam in Romania. Anyway, back to the luminous paint. It turns out promethium-based paint was used to illuminate switches and panels in Apollo Lunar Modules and Lunar Roving Vehicles. A report on protecting against radiation during the Apollo missions — including both natural and artificial sources — can be found online (pdf here). It turns out that this isn’t the only link between promethium and space, however. One of the first things I came across when researching the piece on promethium was an article in Discover Magazine called The Strangest (and Second-Strangest) Star in the Galaxy. It turns out that there are some really strange stars out there that appear to have odd elemental compositions, including some short-lived elements, including — you guessed it — promethium. There are a number of possible explanations for these observations and Jason Wright in the Department of Astronomy and Astrophysics at Penn State University has written a series of blog posts outlining what they may be. Without giving too much away (you should really go and read these for yourself), the explanations range from neutron stars, to yet-undiscovered heavier elements in the island of stability, or, perhaps… aliens! So there you go… digging out everything I needed for a roughly 700-word essay on an element that I didn’t really know anything about has also resulted in this 2,500-word blog post… something of a #longread I guess. Congratulations if you made it to the end! This entry was posted in Uncategorized and tagged aliens, chemical elements, elements, francium, in your element, jacs, nature, periodic table, pnas, prometheus, promethium, przybylskis star, segrè, technetium. Bookmark the permalink. Science made interesting! You’ve inspired my Thanksgiving table, which includes a couple of preteens – one of whom was overheard chanting a ditty on the elements. We will put our AG utensils into an AL203 tray. We will liberally sprinkle NaHCO3, then add boiling H2O. Once a fine luster is revealed, we will admire the transformation and discuss what happened. Then we will calculate the cost of our clean and compare commercial alternatives. We will set the table according to norms of yore, and include silver plate here and there, for a discussion of difference and practicality. Thanks!